Hope's Cafe: Measure Up Bowls Review! The Measure Up Bowl gives you easy portion control in a bowl. These are really a unique product, that make it easy for anyone (whether dieting or not) to practice portion control! You can purchase the small bowl, which features 1/4, 1/2 and 3/4 cup measurement lines, or the classic bowl, featuring 1/2, 1, 1-1/2 and 2 cup lines. (These also come as a 2-bowl set). I received the Combination Measure Up Bowls, and I have really enjoyed using them. These are perfect for measuring cereal, ice cream, pasta, fruits, etc. Even for someone who is not on a diet, it's very helpful to control eating habits! These bowls make it so easy to just measure out the perfect amount. No more worrying about finding a measuring cup or guessing at how much you have in your bowl. 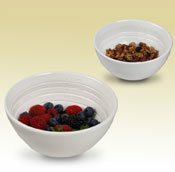 The bowls are made of a lovely porcelain that will blend with almost any dish set! I really like that the bowls are also dishwasher and microwave safe, so you can use them just like your normal bowls. My name is Heather Harvey, and after the birth of my first child I gained a ton of weight. I became pregnant with my second child, and was out of shape, tired and really needed to make some changes. I had struggled with my weight since the age of 13. I had tried fad diets, pills, teas, diets where the food is provided, and some worked for a time. All of these years I failed to realize that it was not a diet but a lifestyle change that I needed. I vowed to get fit. I did not know how to get started, but I joined a gym. I was limited at what I could do. I signed up with a trainer who is also a chef and a nutrition coach. She helped me learn what you eat is important, but even more important is HOW MUCH you eat. She explained creating a deficit of 3500 calories is the loss of 1 pound. She told me to journal everything that I ate. That way I knew exactly how many calories I was taking into my body. One morning while measuring out my cereal, I though this would be so much easier if the measurements for what I was eating was inside of the bowl I was eating out of. I wouldn't need to wash or store the measuring cups. It would eliminate a whole step. I looked for it and could not find it anywhere. So I started developing the Measure Up Bowl. That was over two years ago, and with hard work and the loving support of my family and friends I am proud to say the Measure Up Bowl is here! I am even prouder to say it took me about 11 months to lose 80 pounds and I have kept it off for over two years. I continue to experiment with different recipes, exercise routines, and fitness strategies. I am developing many other Measure Up healthy lifestyle tools such as a Measure Up Journal, a plastic children's Measure Up Bowl, and many other fun and exciting products soon to be announced. I have taken every step in this weight loss journey and sincerely hope my experiences and products help you no matter what your goals are." I have really enjoyed using these bowls. Although I'm not dieting, I do like to control how much I eat, and these have helped. Now I can make sure I'm not overeating on the ice cream, yet still enjoy it! Disclaimer: I was not monetarily compensated in any way for this review. I did receive product for the purpose of review. All thoughts and opinions are mine. All quotes taken from the Measure Up Bowls website.